My journey to financial empowerment. Subcribe to My Blog Now! Want to Earn Extra $$$?? SHOP ONLINE AND EARN CASH BACK!!!! The Harder I Work, The Luckier I Am!! Wow I am doing pretty good with this Craig's List thing. I just sold my wooden futon for $75. I have a TI-85 calculator listed for sale on CL for $75 and I got several bites yesterday. One college kid is supposed to call me later to come over and check it out. Usually thats code for him coming over and actually buying the calc. At least that's how its always worked out for me. I am almost done with my summer cleaning and have some other things I want to list for sale. I am putting all the money I make into my spending account. I haven't figured out what I will do with it yet. I can take it and pay off some of my credit card debt. Or I can take it and use it the next time I go see the family which will be a few days before my sister's wedding. I am leaning toward the latter because I know I will need to spend money when I get down there. If it's not for the fam it will be for my sister's bridal shower and bachlorette party. Well I think I just sold myself on option number 2. I know I will need to dish some moola out that week so i might as well plan ahead and have the money there in my spending account. This should keep me from charging anything to my credit cards. Well off to finish cleaning. I have finally found the courage to admit another factor to my increasing credit card debt........my family. The dress was a must so I guess I can subtract from the total. Lunch @ Panera's was kinda unavoidable. I was going there to grab a an iced Chai latte and they tagged along. Iced Chai latte turned into lunch for 3. How could I say no?? :-/. We had an awesome time so I really wouldn't have changed that for anything. My mom had major abdominal surgery a month ago and can't work for another month. So she will have basically been out of work for 2 months. Pops has a medical issue that keeps him from working in his trade (irrigation) and therefore has been out of work for the past 2 months and he has basically said he ain't going back to work. Sis #1 is bout to get married and all her money is directed towards the wedding and new crib with hubby-to-be. She doesn't help out at all. Sis #2 is paying her way through college. I mean she pays for everything: tuition, books, tests, etc. So her extra money to help out the household is limited. Bro is 17 and is entering his senior year in high school. He is a star football player in our county and is being heavily sought after by dozens of colleges. He also maintains a 3.9 GPA. He has school and football to concentrate on and has no time to work. Thanks to my persistence, my parents had a very nice savings account going into all this. But due to the upcoming wedding and lack of income coming in, that account is about dried out now. So needless to say my family needs me right now and I would be a horrible daughter and sister to not help out. Plus thats my family....I'd do anything for them.....even ruin my credit and increase my credit card debt. My finances are in my face 24/7 so I can't help but to see the impact it is having on my goals. Last week I paid for my mom and brother's phone and then paid the electricity bill. The reason I wind up putting everything on credit card is because all my money has already gone to pay bills. Everything else is in savings account that I can't touch at that moment. I used up everything in my spending account and had to resort to my credit cards. So what do I do? I mean I'll tell you right now......if my family needs me I will drop everything and do what I can in a heartbeat. Even if I need to clear out all my savings. So is there a way to help out and still stay on track with my goals??? If so please let me know. Cuz right now, this looks to be an issue that has no solution. All this is nothing new. It's like a cycle. Couple of months everything is good then something crazy happens and it goes bad. Hopefully this won't go on for much longer. This is why I really need to find a way to bring in some extra dough. Then I could help out using that money. I still haven't had time or the resources to try out the whole notary signing agent thing. From what my friend says, you can make some nice secondary income on that. If only I could just win the lottery. I don't even need that much...........$100,000 could pay off all my debt and I would still have a lot left over to give to my parents ($25K). Sorry for the lack of posting this week. My week from hell was followed by a week of blessings. My co-workers were able to help me get back all my information and work emails. I am truly grateful for their help. And having the laptop has been such a convenience and so essential with my job. We were finally given the go ahead on the new building and I have been working from it since last week. The building is beautiful and has the latest high tech gadgets. Only thing is we don't have computers. This hasn't been an issue since EVERYONE at my job has a laptop. So we just bring our laptops in, connect to the Wi-Fi they have set up and work. If I didn't have a laptop I wouldn't be able to do any work out here. So I guess everything happens for a reason. Speaking of things happening, my cable stopped working the same day my computer died. The cable guy came out on Wednesday to check out what was going on. Come to find out that lightning had struck my apartment and burned out all the cable wires! That explains what happened to my desktop. Isn't that crazy? Talk about anomalies. I winded up giving my desktop CPU to one of my co-workers. Majority of my co-workers are computer gurus and he is one of them. I was going to throw it away but he said he would take it off my hands so he could take the parts like my 2G of memory, processor, etc. I am not into computer like that so I didn't care. Well I get a call this morning around 10:30 on my work cell. Who in the heck is calling me on my work cell on the weekend?! It's my co-worker. Looks like my hard drive wasn't fried like the guy at Geek Squad lead me to believe. My motherboard was what was dead and therefore my hard drive wouldn't start up unless it was taken out and hooked up to another computer. So I got all my personal information back. At first I was pissed because I felt like I just bought this laptop and the whole while their was nothing seriously wrong with desktop. My co-worker explained that I would have had to dish out about $125 for the motherboard, $50 for the power supply, and still have labor to pay. It would have been about $300-$350 total. So I was better off getting the new comp for $449 (after rebate). I deposited my money from my monitor sale this morning and sent a payment to MBNA (card I charged the laptop to) for the same amount. I had a big project due at work this past Monday. I have been so swamped with other projects that I put this one off to the last minute. Needless to say I didn't start crunching until Friday the 13th. So from Friday until Sunday night I had been working like a mad woman. About 25 hours worth of work. By Sunday night I am basically finished with my project. I save everything to my 1G flash drive and I turn off my computer. I wake up the next morning, turn my computer back on, and make some coffee. When I come back I notice that my computer is not recognizing the flash drive. Is something wrong with the computer? I mean it is 5 years old. So I turn it off and turn it back on. Still nothing. No worries. I'll just take my flash drive to work, pull the project up there, do the last finishing touches and send it off. Well the computers at work didn't recognize my flash drive either. Neither are my co-workers' laptops. Diagnosis: I burned out my flash drive. I had been working so much that I basically nuked the dang on thing. I lost everything! Two years worth of work. Last time I backed up my drive?.......April 21, 2007. So now Mz Dimps has to redo this project and meet the now extended deadline of this Friday, all the while working on two brand new projects that just got put on her plate. You would think that would be the end to the bull right? Naw man. Icing on the cake is when I came home on Thursday and find my computer dead. I took it to the Geek Squad and they told me that a power surge killed my power supply and toasted my motherboard. They couldn't even retrieve the information on my hard drive. And remember......I still have the project to turn in on Friday. So I have no other choice buy a new computer. After giving as much thought as I could, I decided it would be best to get a laptop. Desktop were running about $900 and the laptop offers me convenience. Yes, after all that noise about a laptop fund, starting one, and then changing my mind due to the issue with my credit card debt, I wind up with a laptop anyways. 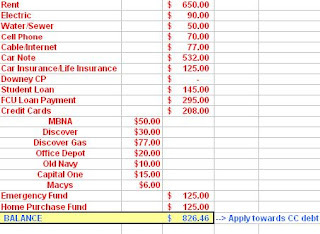 I am trying to find ways to make some money back to offset the $ I had charge to my credit card. I had a flat panel monitor with my desktp that I no longer needed. One of my co-workers was looking to buy one so he bought mine for $125 bucks. There was a $150 mail-in-rebate on the laptop I purchased. I am mailing that out tomorrow. I have a subwoofer and speaker set that I no longer need so I am going to try and sell that on Ebay. Looks like I may be able to get abotu $25 for it since it is about 5 years old. I have a wood futon that I have been trying to keep a hold of. It's taking up a lot of room and I know I can get about $150 maybe $200 for it due to the type of futon and it's quality. So I will most likely list that on Craig's List tomorrow also. Doesn't look that bad. Hopefully the futon and speaker sale fall through. I am also contemplating redeeming my American express reward for a $250 AMEX card or cheque. If I can do that I will basically have offset the damage and wind up pocketing $22. I decided to take the time to understand why I keep building more debt. I need to find out exactly what are the underlying factors when it comes to my accumulation of credit card debt. I pulled 2006 annual reports for all my credit cards and did some analysis to try and find a pattern..........a "method to the madness" as they say. I found myself encountering one major issue over and over again. It's like a sickness and I need to find the cure pronto. I spent so much on shopping (I will do a post with all my findings later) but I have nothing, I mean ABSOLUTELY nothing to show for it. And guess what?!! Majority of the shopping was done ONLINE!!!! I mean like 90% of it was all online orders. Wow!! So I asked myself, "Why do I shop online so much?". I answered back, "Well it's convenient, I don't have to deal with other shoppers or wait in line at a register, and I get all those awesome coupons and promotions via email that I just can't pass up". I then realized something, 99% of my shopping online started off with an email I just received from a store about their current sale and usually a nice "preferred customer" coupon code was included. I can' tell you how many times I logged myself onto Macy's.com to check out an ongoing sale knowing full well I didn't NEED anything. All I could think about is how I couldn't pass up that "50%-70% off clearance" sale that they had and that I had a coupon code for free shipping and it made no sense to not buy something. Shopping online had become an addiction. I had to do something about it..................I needed to get rid of those emails. I logged into my email account and there were 3 store emails already waiting for me. I opened each one up and unsubscribed from them all. Over the course of 3 days I have unsubscribed from 16 stores. It felt good to do it. I feel like I am finally going in the right direction. As I discover and understand the issues that contribute to my credit card debt, I will find solutions to eliminate them from my life. I need to establish a foundation that will encourage a life full of purpose, accomplishments, happiness, and joy. A foundation of debt is not the answer. I need to stop tolerating less than I deserve. I deserve to be debt free. I deserve to be able to take vacations and be carefree.....just a little anyways. What does my Pudding Score™ mean? Your Pudding Score™ is a measure of how your current retirement fund assets compare to the amount the Benchmark Account says someone your age and pay should have accumulated by now. A score above 100 says you are ahead of the index at this point in time and a score below 100 says you lag behind the index’s pace. My pudding score is a divine 126!! Finally, I am getting something right. It's about 1:10 am here and I have been cranking away at this stuff for the past 3 hours. Needless to say I am real tired. I recalculated my budget for the month of July and August. After all bills are paid, I will have about $800 to apply towards my credit card debt. The budget is only the the next two months because I did not include my daughter's school costs which I am not paying right now. I'll edit my budget to include that expense once she gets back and I find out what the rate will be for this school year. You probably wondering why gas or groceries are not included in my budget. Well I have decided to pay for those out of my spending account. Right now I do about $150 or more with cash duck. I am pursuing a few other venues to make extra money and majority of them seem like they will play out nicely (I'll do a post once I am 100% sure). I also have yet to try that whole notary thing. I will attempt this for the next two months and see how well I do. If I can bring in enough to take care of those two then they won't be included in my budget. I created a credit card debt profile. Looks like I charged back more than I first thought. I almost had a seizure when I saw the total. UGH! To think I was around $5000 in February. *shaking head* Anyways, I get paid on 7/16 and after all bills are paid I will have $500 dollars to apply to my debt. I pointed out the 3 cards I will be paying off then. After redoing my budget and creating the cc debt profile I realized I would need to revisit the personal finance goals I had set for myself and see if they were still achievable. I had to push back majority of the due dates but everything looks attainable in the time period that is now set. Thanks everyone for your comments and advice regarding my last two posts. In regards to the American Express reward, I have decided to wait until I am able to redeem the reward and make a decision then. Based on the fine print, the reward points will show up on my account 10 to 12 weeks from now. Thats around late September, early October. A lot can happen by then. So I will choose a reward that better fits my situation at that moment. Due to the severity of my financial status, I have decided to put a hold on the whole vacation account. I need to focus as much as I can towards eliminating my credit card debt. And there is no way I can take a vacation and enjoy myself knowing full well what awaits me when I get back. I think I'll just wait until after I buy my house and payoff my debt. Then I can enjoy my vacation guilt-free. Laptop fund is going away also. The laptop is something I wanted not needed. I have survived until now without one, so another year won't matter. I would like to thank SingleGuyMoney for his post on TrueCredit. TrueCredit basically gives you access to all 3 credit reports and all 3 credit scores. They also have other cool features like debt-to-income analysis, available credit, and so on. If you go straight to their site the service is $14.95 a month. But if you go through Walmart Financial Services you can get the same service for $11.21 a month. For $11.21 a month I can monitor my credit report and scores. I think thats a great trade off. I have a confession to make. 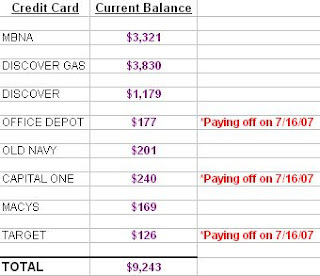 I have not been on my credit debt reduction game like I should be. I mean I paid down $3000 of it late February when I first began. But I seem to have added an additional $1500 since March. And I can't even tell yall where all that money came from. I have no clue.............well I have a clue but not any one thing I can put my finger on. UGH!! I am so frustrated with myself. I am starting to repeat exactly what I did a year ago. Last year in May I went to my credit union and applied for a personal loan. I had a lil under $10,000 of credit card debt and I wanted to pay it off with a personal loan. Reason being that I would have a lower interest rate on the loan compared to the 25% or higher APR on my cards. This would allow me to save a lot of money over the course of my repayment and a personal loan didn't affect your credit report or score as much as credit card debt. I got approved for the loan (16% APR) and paid off every single credit card. Then I went and cut up my cards so I wouldn't have access to them. You would think that would be the end of it right? Wrong! Oh so very wrong! Guess what you don't need when shopping online?? A physical credit card. Like I said before, I have an awesome memory when it comes to numbers. And I had memorized bout 5 credit card numbers of the 12 plus I had. Needless to say I racked up $8000 in debt by that following December. So now I had a $10,000 personal loan and $8000 in credit card debt. I can see yall shaking yall heads right now........*sigh*. All I can say is that after 5 years of being a broke single mother/college student I got thrown into a situation where I felt like I needed to "look" the part in order to fit in. I was trying to "keep up with the Joneses" as they say. I was stupid when it came to my finances and I am paying dearly for that stupidity now. I can not and WILL not be in debt for the rest of my life. I am going to have to take another look at the credit card debt payoff plan that I have right now and probably revamp it.......a lot. I need to be more aggressive in my debt elimination as I am in my savings. Even though I want to enjoy myself and live comfortably I may have to cut back on that spending account that I have and redirect majority of that extra money to my debt. I would rather sacrifice for a year and be debt free. I will still have a lil to spend for myself but only on important things like hair care and gym membership (they are important to me anyways...lol). Four of my close friends just got back from the Essence Festival in Louisiana. Some are going to Vegas in August for 5 days. I was invited for both trips but declined after I realized how much I would need to spend. For some reason I can't imagine spending so much money for those trips. I try and have an open mind about the whole thing but I just feel like it shouldn't cost me an arm and a leg to travel to another state for a few days. My current goal for now is to put $50 a month into the fund. I don't have any trips set in stone right now. I know that I definitely want to go to Atlanta to visit a close friend before the year is over. I am going to need to do my budget over and see how all this new stuff impacts my finances. I don't think $50 will have a huge impact but we shall see. Hopefully I can get that posted tonight. Laptop fund, New House, or Vacay?? I applied and got approved for an American Express Business Gold Card on Saturday. I applied for the card through Cash Duck, who pays you $80 once you get approved for the card and make your first purchase. I also received American Express' current promo. In a nutshell, you get 25,000 reward points after your first purchase that can be redeemed for a $250 gift card to any of the stores that are on the list or a round-trip ticket to anywhere in the US. I know I said before that I wouldn't apply for anymore cards but I couldn't pass this one up. And after doing some research I found that because it is a business account it will not show up on your credit report. That was the icing on top of the $330 cake ($80 from Cask Duck and $250 from American Express). 3. Round trip ticket to somewhere in the US. Option 1 would contribute to my future laptop. It would be essentially be $250 in my laptop fund bringing me even closer to my goal. Option 2 would be used after the purchase of my home. I love Linens N' Things and I could get a lot of items for the new house for $250. Option 3 would be used for a very well-deserved vacation somewhere in the US. Wow this played out better than I thought. My initial reason for applying the for the card was to take advantage of the free ticket. But now I have discovered more options and I have no clue which one to go with. All three are great options and would effect some important goals I have set right now. So what do you guys think? Which one should I choose? P.S. The $80 I will be getting from Cash Duck is already allotted for my spending fund so it wasn't calculated into the options above. 8 random things about myself! I don't eat red meat. Haven't in 12 years. I am the first in my family to graduate from high school, go to college, and earn a degree. I have one tattoo. Its on my right thigh. I have never thrown up or blacked out from drinking (heavy drinking). My favorites shoe brands are Sketchers and K-Swiss. I never studied in high school but still graduated with a 4.3 out of 4.0 GPA. I have an excellent memory when it comes to numbers but I am horrible with names. I am leaving to go down south to my parents tomorrow. I can't wait to see my sweet pea. I miss her so much. I'll be back on Friday. Have a wonderful 4th of July. Eat lots of BBQ. And be safe. I finally found a bank that had all the requirements I needed for my laptop fund. I opened a money market account with Capital One Saturday morning. I have a credit card with them and while checking my credit card statement I noticed that they had a very nice high yield money market account. There was no minimum balance to open or to maintain. Their APY is 4.75%. No fees. And they offer free checks and an ATM card. There was no bonus which is fine with me. I am pretty happy with my choice. The purpose of this blog is to share my own experience, opinion, and choices on topics dealing with personal finance. I am not a financial adviser nor am I licensed. I am no way liable for any unfortunate consequences you may come upon as a result of reading this blog. Please consult a licensed professional for financial services.